This striking plant is native to tropical and semi-tropical regions of Africa and the Mediterranean. Aloe has been used for centuries, and mentioned by Dioscorides (one of the fathers of herbal medicine) in 78 AD and mentioned in medicinal books dating back to the 10 th century in Europe. Aloe, native to Africa, found its way to the west via trade routes from Egypt and Africa. It was successfully introduced to the West Indies in the 17th century. 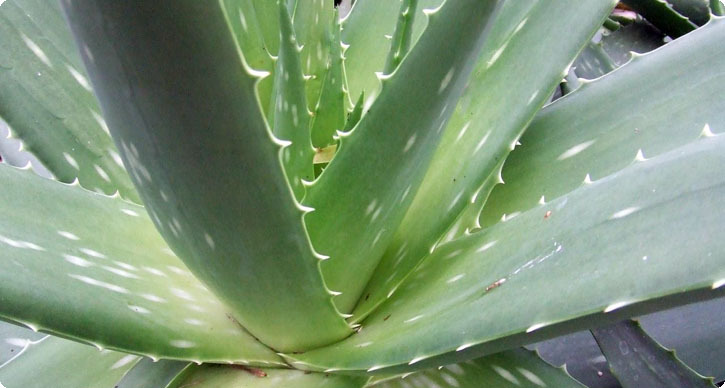 What are Aloe Vera Plants? Aloe Vera is an herb, known for anti-inflammatory properties. A succulent plant that has no stem, the fleshy leaves hold special sacs filled with a gel that is released when the leaf is cut. The gel itself contains anti-inflammatory saponins (act as the plant’s natural immune system), as well as antimicrobial anthraquinones, vitamins C and E as well as minerals and salycilic acid. The gel is used to soothe burns, cuts and any skin inflammation. Because it activates rapid healing, make sure that any cut or abrasion is cleaned thoroughly before applying the gel. There are considerations when taking orally and should be AVOIDED during pregnancy or breast feeding. Drainage is critical so make sure that you provide them with a ‘gritty’ potting mixture. Add sand or grit to your potting mix; water should run off easily. Use a small pot when planting up your aloe, and make sure that the plant doesn’t have too much extra soil. In fact, try to ensure that the roots take up almost two-thirds of the pot. Plastic or clay pots are fine but drainage holes are a must! During the hot summer months, watering once a week will suffice. When the temperatures drop below 80 degrees, move your plant indoors and slow down on the watering frequency to 2 times a month. AVOID wet feet – make sure that the plants dry out between watering. Avoid full sun as aloes will do best in bright, indirect light. When brought indoors, a east or south facing window is best. Fertilizing is not a must, but a light periodic feeding with a diluted solution will be best.